Original Fine Art drawings by Sheila L. Kalkbrenner are reproduced in this book for children of all ages. 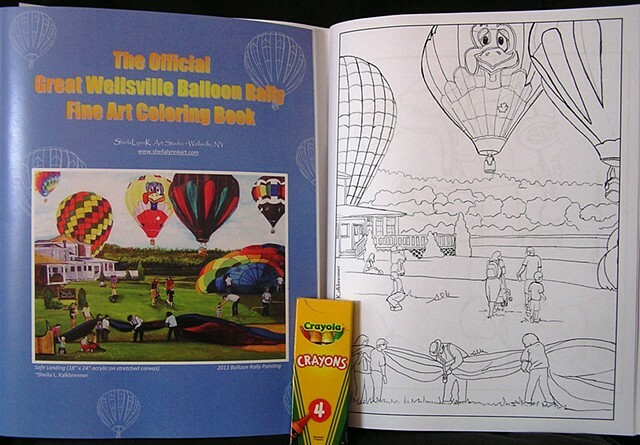 This first coloring book from SheilaLynnK Art Studio has a Balloon Festival theme in recognition of the Official Great Wellsville Balloon Rally 2013. Safe Landing a Sheila L. Kalkbrenner original painting, is pictured on the cover. 20 pages. Each page is printed on one side only for multi-media use. This series was printed by Citizen Printing House using 80# HCC for the cover and 20# Navigator mulipurpose white pages with a folded, saddle stitched binding. For best results: place scrap paper between pages to absorb any excess moisture.